The NCAR/Earth Observing Laboratory is prepared to accept your data sets and documentation for the PacMARS project. 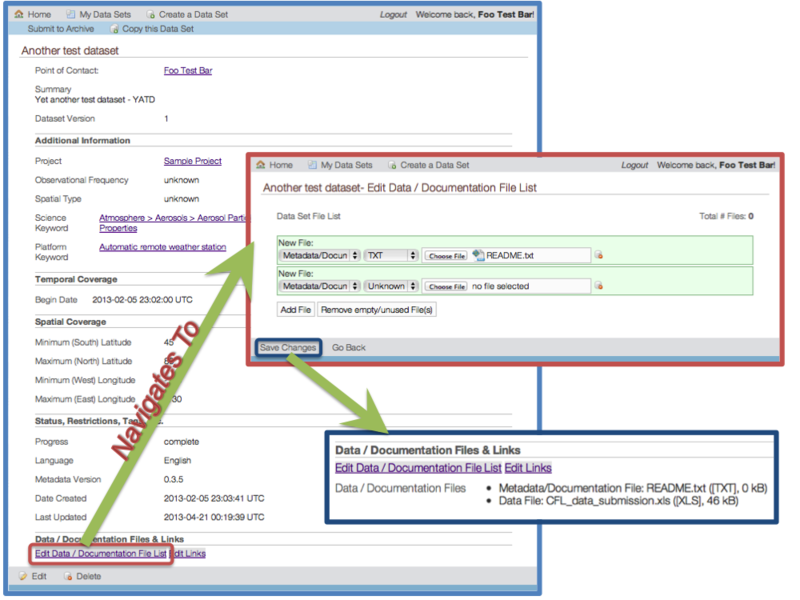 Data sets can be submitted using the MetaArch submission tool. To access the MetaArch submission tool, click here. Please note that your login information for the MetaArch submission tool is not the same as your login for the mapserver. If you are uncertain as to your login information or if you do not have a login for MetaArch, please contact us at metaarch at eol dot ucar dot edu. A data set is a collection of related data and documentation files. For example, underway seawater sampling data collected aboard a cruise as compiled into one or more data files with the appropriate documentation would be considered a data set. To submit a data set to the archive, fill out the "Create a Data Set" form for the PacMARS project. To log into MetaArch and immediately begin filling out this form, click here. Previously uploaded files for this data set will already appear in the list. Files must be identified with their purpose (i.e. data file, event log, or metadata/documentation) and format type (e.g. ASCII text, shape file, Excel spreadsheet, etc.) when being added to the list. It is very important that you include documentation with your data. Identify this file as "Metadata/Documentation" when adding it to the list. Note: We have included a "Submit to Archive" button at the top of the data set viewing page. Please be sure to submit your data set to the PacMARS archive when your data and documentation files have been uploaded. If you have one or more files which are over 100 MB in size (per file), or have a larger quantity of files to submit, it is recommended that you use our FTP space to submit your files. For detailed instructions on how to use FTP, click here. We are also prepared to receive other media my means of shipping. Please send an e-mail to the PacMARS data management support team (pacmars at eol dot ucar dot edu) to confirm that you have submitted data and documentation to our submission site or have shipped other media to us. Data submissions will be checked over for completeness of metadata and then added to the archive. Please e-mail the PacMARS data management support team (pacmars at eol dot ucar dot edu) if there are any other questions. Thanks in advance for your help.